Our bookmarks are exceptional quality. The colors and finish are the best. Production time was very quick. Exactly what I wanted. Thanks for going the extra mile to cut a custom bookmark size for my order. They are reasonably priced and communicate well. I was able to see the pdf mock-up before they printed my bookmarks. What I didn't see though was that the font came out pixelated. That's my only complaint. Since I'm giving my bookmarks away, it's not a huge deal, but it is a bummer to give away a less professional-looking product. The service was personal and very helpful to complete the electronic files. The quality of the bookmarks was exceptional. I will use them again next year. Quality is excellent and reasonable prices. Service is fast and on time. Well priced, quick turnaround, good quality. Need Bookmark Printing Now? We’ll make it Easy For You! 2 x 6 and 2½ x 8½. We offer high gloss UV coating on 12 or 14pt Gloss Cover and 100# Uncoated Cover; printed 4/4, 4/1 or 4/0. Our creative and personalized custom bookmarks are an effective and inexpensive marketing tool. They are fast and easy to make and are a perfect giveaway to connect with people and customers to showcase your message. If you are an individual, small business, large corporation, professional, school or an organization, ordering bookmarks can help spread your message, make great prizes for members, employees and students; and so much more. Some fun ideas for bookmarks would be to: Personalize your gift tags and create tickets for events, plays, parties and even coupons. They make great souvenirs for resorts, hotels and other travel related business and whatever else you can think of. 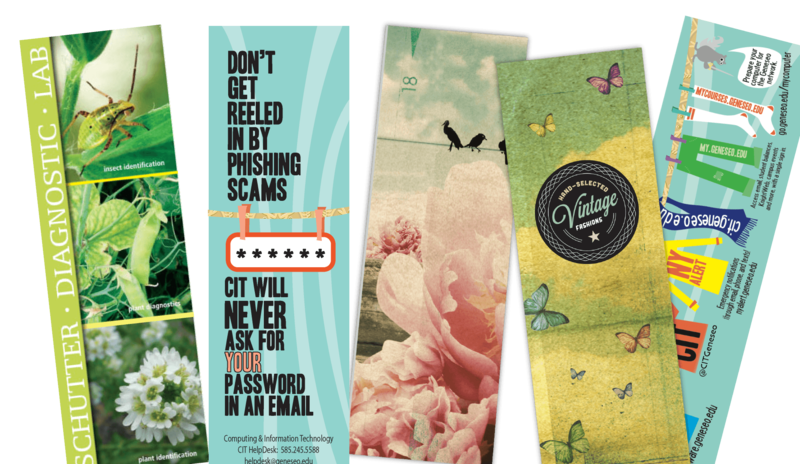 Create a bookmark with our free online bookmark design services now! Upload your logo, name and address and industry on your bookmark; fold them in half and you have a fold-over business card that fits in your pocket or wallet.